Tom Clancy has an interesting quote: "Why do people have a fixation with the German Military when they haven't won a war since 1871?". The question is a valid one, when one looks at just how the US military has studied and implemented a number of tactics and doctrine that the Germans used in the Second World War. Two articles that were published recently look at this very issue, essentially summing up to one question: why hasn't the US military shifted its focus and strategy out of World War Two? This is an especially interesting issue when one takes into consideration the troubles that US forces have in the Middle East conflict, as enemy soldiers have changed how they meet the enemy, while the United States has not reacted to change in the same way. Currently, US forces are working their way into Marja, with a new push to rid the region of insurgents, but also to demonstrate to local Afghans that the US can be effective in their nation's security by training their own soldiers. In the past eight years that we have gone to war in Iraq and Afghanistan, the rules of warfare have drastically changed from what war planners anticipated, and from most wars of the past. In a recent article for Foreign Policy magazine, John Arquilla has an interesting observation: "Flanking also formed a basis for the march up Mesopotamia by U.S. Forces in 2003. But something odd happened this time. In the words of military historian John Keegan, the large Iraqi army of more than 400,000 troops just 'melted away'. There were no great battles of encirclement and only a handful of firefights along the way to Baghdad. Instead, Iraqis largely waited until their country was overrun and then mounted an insurgency based on tip-and-run attacks and bombings." (John Arquilla, The New Rules of War, Foreign Policy, March/April, 7) The lead up to the first Gulf War in 1991 followed a number of similar principles, with a massive military force, ready to move with an incredible amount of speed, utilized technology and new unit tactics borne out of changes in the military in the fallout from Vietnam. The Iraqi military was destroyed, but with little follow up, the country and its organization remained. 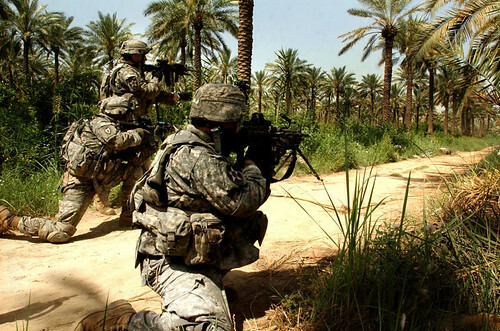 What the Iraq and Afghanistan wars have demonstrated is that there is an increasing use, and success against U.S. forces, in irregular or asymmetric warfare that runs counter to the current thinking and training within the U.S. Army and within military study. As the playing field has begun to change, the thinking behind how the military conducts its operations must to change to effectively meet enemy forces on the battlefield. Already, there have been incredible successes in how changes in tactics have been implemented in both Iraq and Afghanistan, with the troop surge in 2008-2009. The surge wasn't just more soldiers committed to the battlefield, it represented an entirely new method in which soldiers were organized against an enemy force. In this instance, a large force broken up in to just a couple larger units just didn't work. Breaking the forces into smaller units, and reexamining the mission and objectives, US forces were able to undertake missions with a higher success rate. However, this line of thinking needs to continue, suggests Arquilla, in the form of better understanding how not only enemy forces are arrayed, but how the U.S. utilizes its military. In a large way, the military needs to be far more flexible with how it goes up against enemy combatants, in in that change, the overall objective for the purpose of the military needs to be sought out. In the mid-1950s, President Eisenhower was elected in part due to his commitment to bring U.S troops out of Korea. In doing so, he redefined how the military operated, as part of how he viewed the role of the Federal Government: smaller and less intrusive. In this, the United States military shifted from a large scale conventional military to one who's force largely rested on the threat of force: a deterrent based military, one which did not rely on the need for the United States to send soldiers overseas for numerous engagements. Now, sixty years in the future, the same thing needs to occur: the military (and the political system that organizes and oversees it) needs to determine exactly what the purpose of the armed forces will be, and what their mandate is. Then, the military can begin to utilize its forces to the best of its abilities, working to merge technology and tactics into something that will help to protect the country in the future.